In Tender Mercies - and in plays from the same period - Foote's characters often don't know what they want. Or can't express it. So how the plot works out sometimes doesn't reflect what they're telling us. It's why Foote's later plays can take unexpected turns. And it's why they suggest these great depths of dammed up, unexpressed feelings. (Mac Sledge, the Duvall character, can sing a plaintive song, but most of the rest of his dialogue comes in two- or three-word sentences.) Foote's mother and father died in 1974-'75 -- his father died in the same room in the same house where Foote's brothers were born. And the loss seemed to open him up as a writer. Soon afterwards, he started writing a cycle of nine plays called Orphans' Home. His writing here is extremely pared away, yet he gives his hometown of Wharton, outside of Houston, the full Faulkner treatment. He chronicles the place from convict laborers to local aristocrats in all its complex social and moral interactions. What I'm saying is that Foote was a much more sophisticated writer than he's often given credit for. Orphans' Home: Even the title seems quaint. But it's actually taken from a poem by Marianne Moore, and it describes all of our sorry lives on this planet ("The world's an orphans' home"). One of the cycle's plays is called Roots in a Parched Ground. That's a line from William Carlos Williams. Whenever I met Foote, he was always the courtly, friendly gentleman the obituaries describe. But he was also a tougher, more determined character than that. He won the Pultizer Prize in 1995 - and he hadn't had a play on Broadway for more than 40 years. And he wouldn't have a full-out Broadway success until this past year. When he died in Hartford on Wednesday, Foote was working on a stage production for this fall. He was adapting Orphans' Home. He was 92 and he'd started writing it 35 years ago. Whenever I met him, Foote was dressed the same way, even standing out in the heat of a Houston street. Navy-blue, double-breasted blazer, grey slacks, velvet slippers. Simple, dapper but comfortable. Foote was the son of a haberdasher, so he knew what he was doing. And once he found it, he stuck with it. You can hear an audio version of this post or watch a video interview of Foote at my day job. Spot on! One of the great American 'unsung' playwrights. Spot on, Jerome. I, too, was chafing a bit at the "awwww, wasn't he cute?" tone of the Northeastern obits - chiefly, from the Gray Lady - that seemed to seriously underestimate Foote's considerable gifts as a playwright. From a dramatic standpoint, there are few things more difficult to pull off in the theater than a genuine sense of stillness. Hell, it's incredibly difficult to pull off in real life! 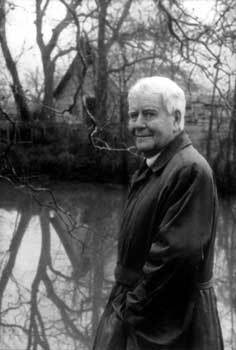 And Horton Foote was a master. Half his genius lay in the words that shaped his dramas; the other half in awkward, aching, guilt-ridden or confused moments of silence that simply tore at your soul. What a loss. What a writer! This page contains a single entry by book/daddy published on March 5, 2009 9:17 PM. Review: Germania by Brendan McNally was the previous entry in this blog. Reasons to be cheerful, Part 7 is the next entry in this blog.